PC Chrono 1.1.0.6: minor bugfixes and even faster startup. PC Chrono 1.1.0.0 release. New features: stopwatch and timer keyboard control and minor improvements. PC Chrono 1.0.1.0 was released. Now it's capable of minimizing to system tray. 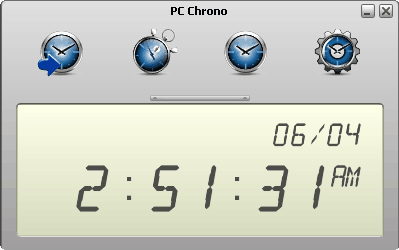 PC Chrono is a freeware timer, stopwatch and clock utility. It is also distributed as a part of 5-cow rated WakeMeUp! Alarm Clock. customizable voice notifications for all modes (timer, stopwatch and clock).